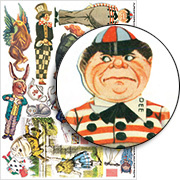 ﻿	Alpha Stamps News » Halloween in Wonderland & Related FREE Tea Gift Kit! 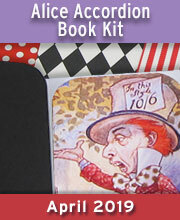 Halloween in Wonderland & Related FREE Tea Gift Kit! 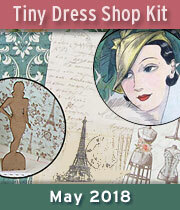 EVERYTHING in the Paper Theatres Collage Sheets section is on sale! 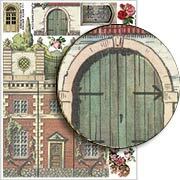 Laura Carson’s House Of Ghosts from Thursday’s newsletter included lots of windows and other architectural trims (all distressed to look old and abandoned). 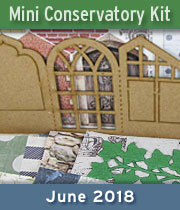 So I picked out a collage sheet section that includes windows (or curtains)… 87 options! The sale ends Monday night! Everything about this project is sooo perfect for Halloween: the color palette is loverly, the reupholstery of the footstool in an orange and black checked fabric is too cute, all the treats on the table (including tiny painted cookies) are bright and colorful (see a close-up below), and the little scene on the wall shelf with painted figurines in purple… a purple Cheshire cat is inspired! Today’s project is one of my favorites as it combines two of my favorite things, Alice in Wonderland and Halloween. 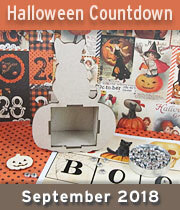 I started off with a Corner Room Box, then covered it with some Halloween in Wonderland paper. A little black paint and some black Dresden to give the outside a polished finish and I was all set to add a scene. I chose to do a tea party in my scene because I love miniature tea sets and sweets. There wasn’t a lot of room in my box for a tea table, soooo… I used the table parts in the Round Table & Chairs Kit to build half the table. I followed the instruction provided in the box and literally only built half of the table (the supports under the table need to be cut in half but everything else is already in halves). I also needed a chair for my tea party, so, I built one of the chairs in the kit and added some spooky extras… a Tiny Resin Skull was glued to the back of the chair and two Resin Boneyard Bones were glued to the sides of the chair instead of the supports from the kit. I sanded down the backs of the bones where they glued onto the chair, with an emery board, so they fit well before I glued them in place with Non-Toxic Cement for Plastic Models. Read more in Teri’s blog post (including how she sprayed all the pieces to be painted with primer). 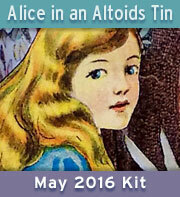 And here’s a link to her Halloween in Wonderland Room Box supply list. 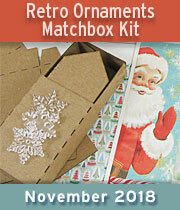 And be sure to come back and enter the Giveaway, to win lots of supplies from Teri’s project! 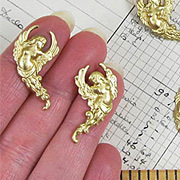 - Moonlit Masquerade (that I think would be perfect to cut into tiny placements). 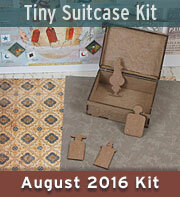 ALL ORDERS on Sunday through Wednesday, October 15-18 (2017) will receive one of these mini kits FREE (until we run out)! 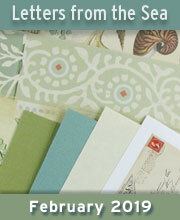 Hooray for the Teatime in Wonderland Giveaway! I just had to zoom in on that fabulously spooky chair that Teri made! I love how she replaced the chair arms with bones (and see the little inset below for how it looked before being painted). 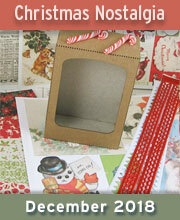 Next up: the paper set that is covering front, back and floor of the room box. 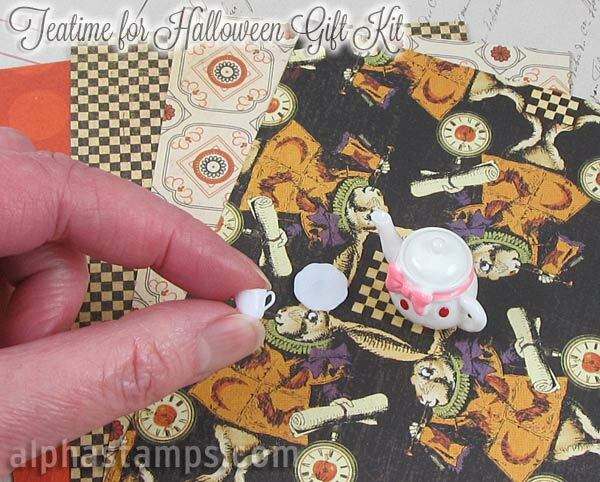 Note: those teacups and the teapot are the same ones included in the Teatime for Halloween Gift Kit! Finally, check out that close-up in the lower right of the large photo: Teri made a skeleton flamingo! I’m not sure what little plastic flamingo figurine Teri painted, but I’m including the pumpkin and the Spun cotton mushrooms! Psst! 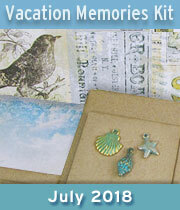 Here’s a link to everything Teri used for her project, though not everything listed is in this Giveaway. To enter the Teatime in Wonderland Giveaway drawing all you have to do is leave a comment BELOW on this blog post TODAY or TOMORROW (the deadline is 11:59 pm PST, Monday Night, October 16, 2017). AND tell me: This is a lot of items… what will you make? Your own version of Teri’s room box scene? Multiple projects? 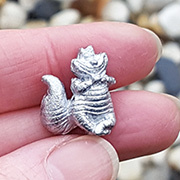 Hey, who won the The Ghost Queen Giveaway from Thursday’s newsletter? That would be Catharine McCammon! Congrats! Check your email for info. What an adorable scene! I would definitely be making my own scene to go with my scenescapes village! 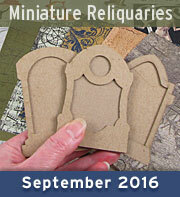 I am totally addicted to minis and Alphastamps has so many incredible elements for making scenes! I would be overjoyed to win this! 🤞🏻🤞🏻🤞🏻🤞🏻🤞🏻🤞🏻 Thanks for the chance to! Congratulations Catharine for winning the last giveaway! October 15th, 2017 at 6:29 am. This is so creative and I am not so I would make a scene like Teri’s but not exactly. I would Angie it up a bit. October 15th, 2017 at 6:36 am. I have some altoid tins that I am thinking some of this will work with to alter!!! October 15th, 2017 at 6:42 am. What a wonderful scene! Love it. So creative. October 15th, 2017 at 6:57 am. That is soooo darn cute!! I’m afraid I would be somewhat of a copycat and make mine quite similar. 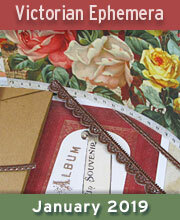 And I love how she used the scrapbook paper for the border on the wall. Love it! Thanks for the chance and congrats to Catherine! October 15th, 2017 at 7:00 am. I love the paper on the walls. I’d use if in my journals. October 15th, 2017 at 7:14 am. I would make a room like this one. I love Halloween in Wonderland. Thank you Teri, for the inspiration. October 15th, 2017 at 7:19 am. Love alice! I have an antique hatters hat form for a tall hat brim. Would love to put an scene in it like this!! October 15th, 2017 at 7:20 am. 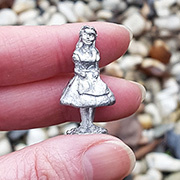 As an ALICE I am an ALICE collector and maker of Alice in Wonderland scenes. I never thought of doing a Halloween one! Of course it makes perfect sense! 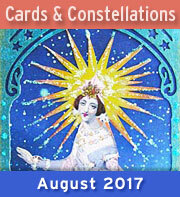 All times of year of the calendar can be represented in Wonderland! Why not! After all I have some Christmas in Wonderland things. I love the idea of Halloween and I think that the designer did a fabulous job on this project. October 15th, 2017 at 7:21 am. Simply delightful! I would definitely make something similar! October 15th, 2017 at 7:27 am. I love the wallpaper and shelf and the chair and all the decorations…..sorry Teri, I need to copy yours!!!!!! October 15th, 2017 at 7:45 am. I would add some lovely details to my witch’s workshop. October 15th, 2017 at 7:51 am. I love Teri’s scene! I would love to make something similar. That flamingo is the best! October 15th, 2017 at 7:59 am. Love this cute Halloween scene. I also like the supply list that is available. Makes it so much easier to get what you need. October 15th, 2017 at 8:01 am. I am in love with the spooky chair! How creative is that! October 15th, 2017 at 8:08 am. Alice stuff. This room is so clever. Also, I belong to a tea group. They will love this. October 15th, 2017 at 8:13 am. Yeah! Love this idea that incorporates my two favorite things, Halloween and Alice. Great project! October 15th, 2017 at 8:20 am. Love this scene, would be a great giveaway at one of my miniature events, if I could bare to give t away….lol. Anything Halloween is is awesome, but to add Alice in Wonderland, it’s even better! October 15th, 2017 at 9:09 am. So cute! Since I have never done a mini scene before I think I would have to stick to the model. If only mine could turn out as lovely! October 15th, 2017 at 9:41 am. Great work, Teri! Thanks for sharing your creations! 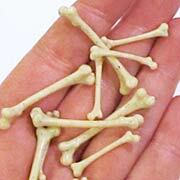 Would like to make a skeleton tea party scene for Day of the Dead. October 15th, 2017 at 9:46 am. October 15th, 2017 at 9:48 am. Love Teri’s scene! 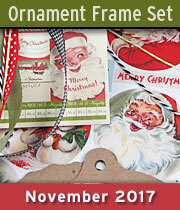 I would use the pieces to decorate my shadowbox I’m working on! October 15th, 2017 at 9:49 am. My daughter’s birthday is on Halloween and she loves Alice in Wonderland. 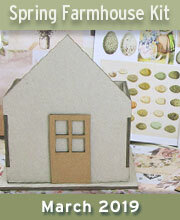 I love making your miniature scenes and she would absolutely love this for her birthday! October 15th, 2017 at 9:51 am. Hmmm… I think I’d make a witchy afternoon tea room. October 15th, 2017 at 10:08 am. Oh Yes! I love it I love it I love it!!! I would like to make my own version, as much like Teri’s version as possible. October 15th, 2017 at 10:24 am. Oh my – this is adorable !! Would definitely keep the Halloween theme ! Love the Cheshire Cat – he’s my favorite villain !! I love Alice in Wonderland! 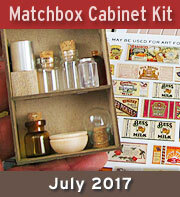 I would use the supplies in my own tea party version. October 15th, 2017 at 10:32 am. October 15th, 2017 at 10:41 am. What a great little scene! I think that flamingo is my favorite part. I must hunt down a mini flamingo! If I won the supplies I would probably make a similar scene, though I might make it a bit creepier. Im so excited! I Love Alice! I will make a Alice mini tea room and then some separate Alice inspired gifts for the holiday season! October 15th, 2017 at 10:57 am. This is probably my favorite scene ever! Love the tea party and Alice theme! Love the use of wall paper! October 15th, 2017 at 11:45 am. Love this project! I have a g45 alice stash i need to stop boarding and use in this little room. It’s simply perfect!! October 15th, 2017 at 11:47 am. I love Halloween Alice! And I especially love what Teri did with the chair. I have a lot of Alice stuff in my stash, and lots of creepy things (including those bones) so I think I’d do either my version of Halloween Alice or a creepy dinner party. October 15th, 2017 at 12:02 pm. Love the Alice Halloween theme. A perfect addition for my Halloween room box project. The Halloween chair is a scream! October 15th, 2017 at 12:31 pm. Alice and tea!! For goodness sake, who wouldn’t love this kit. The room is so clever with skeleton bones on the chairs and that clock shelf is calling to me. Teri did it again. I would love to make a room with this kit. October 15th, 2017 at 12:53 pm. I would definitely make an Alice scene with the things in the giveaway. I love Alice and I love Halloween! That skeleton chair is just so clever! Need to do that too! October 15th, 2017 at 12:56 pm. 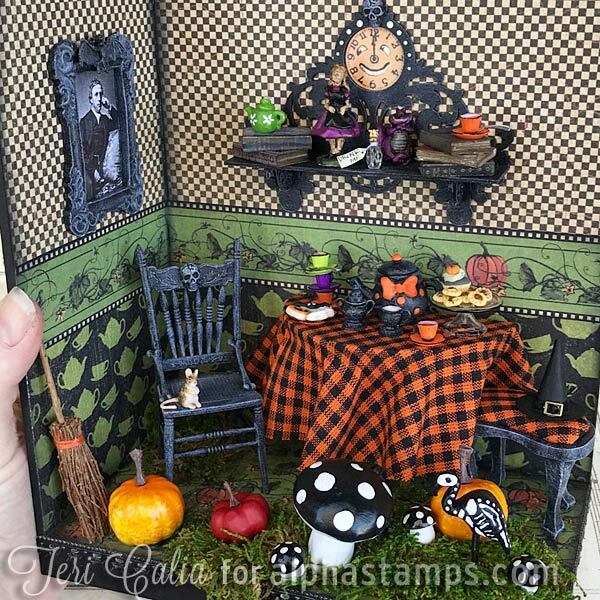 What a wonderfully creative little scene,I would use it in one of my Halloween houses. October 15th, 2017 at 1:26 pm. October 15th, 2017 at 1:56 pm. Halloween’s Alice in Wonderland – who could ask for more. Both are favorites. Thanks for sharing. October 15th, 2017 at 2:26 pm. Wow, this is the most darkly delightful Alice set I’ve seen. I would love to make this and show it off to my friends! October 15th, 2017 at 3:05 pm. October 15th, 2017 at 3:14 pm. I am in love with this darling little scene. I am particularly fond of the chair! October 15th, 2017 at 4:17 pm. What a fabulous give away!!! 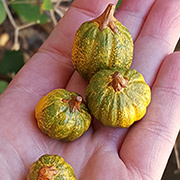 I see me making a witchy setting, perhaps a Halloween party inside a carvable pumpkin. I’ve managed to amass a great deal of spooky stuff over the years from Alpha stamps, so it will be quite a party. Fingers and toes crossed here. October 15th, 2017 at 4:25 pm. October 15th, 2017 at 4:31 pm. I love these pieces and ideas! 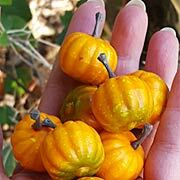 Would love to incorporate them into my miniature Halloween house! October 15th, 2017 at 4:48 pm. I love all these elements!! I would make a similar version of her Halloween room! October 15th, 2017 at 5:03 pm. 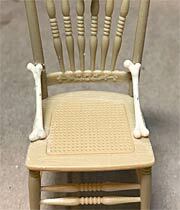 I would have to do a Halloween scene with a chair just like Terrie’s. Love that chair! October 15th, 2017 at 6:14 pm. 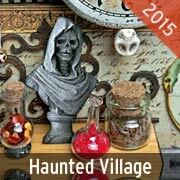 I am working on a small Halloween spook house & these items would be perfect to add to the room! Love Halloween the best of all holidays! October 15th, 2017 at 6:26 pm. October 15th, 2017 at 6:51 pm. Yes, would have to be a Alice in Wonderland scene for Halloween. October 15th, 2017 at 7:15 pm. I love the Halloween tea party idea. This would be such a great project- spooky and adorable. You can’t go wrong with anything Alice. October 15th, 2017 at 8:19 pm. I would combine this with some other things I have collected along the way and make my own version of this scene. October 15th, 2017 at 8:33 pm. 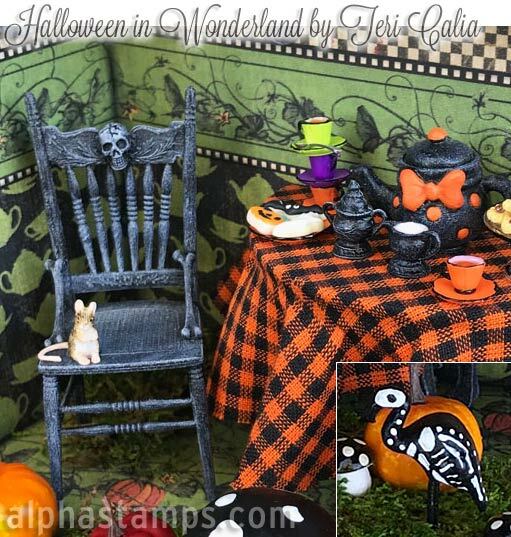 Simply fantastic Halloween in Wonderland Tea Party scene! Love how she altered the tea set and chair! I would love to create a similar scene! October 15th, 2017 at 9:48 pm. October 15th, 2017 at 10:27 pm. What a great take on “Alice”! Would enjoy making a similar project! October 16th, 2017 at 3:57 am. What a cute scene. 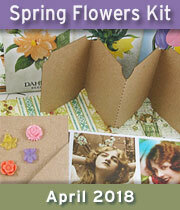 I would have to create something very similar for my sister who loves all things “Alice”. October 16th, 2017 at 4:50 am. I would either make something similar or use it in the mini haunted house I am making. October 16th, 2017 at 5:43 am. I would love to make something like Terri’s. I love Alice in Wonderland and Halloween, what an awesome combination. October 16th, 2017 at 5:45 am. I would use this in my dollhouse. 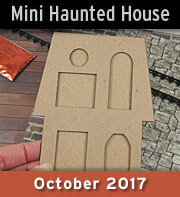 I have been wanting to make a haunted dollhouse. October 16th, 2017 at 6:01 am. So cute. Love the bones on the chair. October 16th, 2017 at 6:14 am. I would make something similar to Terri’s but creep it up a bit!! October 16th, 2017 at 6:53 am. I am currently making a haunted Wonderland scene in half of a hollowed-out craft pumpkin. This would fit right in and add some lovely details. Brilliant inspiration! October 16th, 2017 at 9:08 am. I adore Teri’s project! 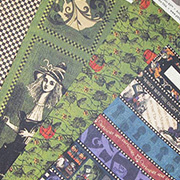 G45′s Halloween in Wonderland is my fave collection of theirs, and Teri used it here in a way I will borrow from. 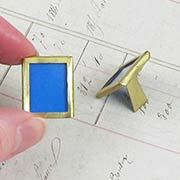 These tiny miniature scenes with their tiny accouterments are exquisite and always suggest many stories to me. LOVE! October 16th, 2017 at 11:10 am. I love the idea of a witch’s nook with a fireplace, comfortable chair and ‘witchy’ books. October 16th, 2017 at 11:36 am. I would use some of the ideas & items to furnish the interior of a haunted dollhouse I’m working on. The chairs especially are so creative & creepy. October 16th, 2017 at 10:04 pm.